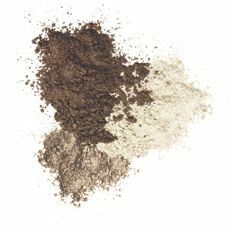 Luxe High Performance Eyeshadow Trio. Mica, Dimethicone, Magnesium Stearate, Phenoxyethanol, Tocopheryl Acetate, Retinyl Palmitate, Tocopherol, Magnesium Ascorbyl Phosphate, Green Tea Extract, Acai, Collagen Amino Acids. May Contain: Titanium Dioxide (CI 77891), Iron Oxide (CI 77499, CI 77492, CI77491), Manganese Violet (CI 77742), Ultramarines (CI 77007). Naturally Pretty Eyeshadow Trio is rated 4.5 out of 5 by 73. Rated 5 out of 5 by Alice Jones from All I Ever Use! I worked in high end retail cosmetics for years and used every brand of eye shadow out there, but this is my go-to favorite. Now that I'm retired, I still want to look pretty, but not artificial. This pallet has everything I need for every look I want. It's subtle and natural for daytime, but can be dramatic for evenings out. Restaurant and night club lights can really wash you out, but this pallet can be applied to play to those lights and you can be beautiful anywhere! This is the only eyeshadow I buy now. I also like how friendly it is to the delicate skin on the lids. I'm constantly complimented on how pretty my eyes are. Not bad for 66! Rated 5 out of 5 by Denn from Smooooooooooth!!!!!! I bought Amber and Plum and when they came I was a bit concerned because the colors looked light. I didn't want to look made up for Halloween but I wasn't sure it would have the richness I desired. Man, was I wrong!! The colors when applied are AMAZING!!! The colors are very rich and blend beautifully. No streaking, creasing, or unevenness. Just beautiful smooth rich color that you can gently use for just a touch of color or amp up for evening for rich smokiness. I have brown/green eyes and these colors make the green stand out. Rated 3 out of 5 by Maxine77 from Good product, but difficult to open compact. I 've purchased many of the IT line, and have always been satisfied with all the products. I purchased the Pretty eyeshadow trio last week and liked the product, but had a very difficult time opening the compact. I suffer from arthritis and is probably my issue, but it might affect other elderly consumers. Thank you for having such a wonderful line. Rated 5 out of 5 by misslinsey from Love it! I have both 'Pretty in Nudes' and 'Pretty in Smoke' and LOVE them. I still want to buy a few of the other colors I am so obsessed! The colors look amazing, blend well together, and stay on all day! I wear an eyeshadow primer, but some eyeshadows still wear off if you've had a long day/evening, but these colors stay on until you wash it off! I would recommend to EVERYONE! Rated 1 out of 5 by Mimi13 from Disappointed I love and use so many of my It products. So I was looking forward to getting this. I like the color. However, it is not good for me. The shadow has a shine that looks terrible on my eyes and makes my eyelids look creepy and me look older. Do you have a shadow that has a matte finish? Help! Rated 5 out of 5 by mrsbob from Prettiy in smoke Pretty in smoke is my favorite winter shadow. I wear a lot of black and gray in the winter. The pale pink shade is perfect for starters and the middle gray is not too harsh for my blue eyes, blonde hair, pale skin. I use the darkest shade for eye liner. I can't say enough about the brush! I own 3 of them because I want ot have it when I travel. Rated 5 out of 5 by pb65 from Perfect colors Love this product, just wish the three colors weren't the same size, I need more of the middle shade and less of the darker color. I do like it that when I travel i don't have to carry several different palettes I can do everything from a daytime eye to a smoky eye using this one product.